For your Friday entertainment, here’s a video from an anonymous Festool user that provides a pretty thorough demo of some extreme situations you can put your Festool drill through and have it still work. In the video, he coats the drill in drywall dust, sand, sawdust, and just-mixed drywall mud, and even immerses it in a bucket of water several times. And yet, after all of this abuse, the drill still works! Pretty effectively too – he manages to drive an auger bit through a 6×6 after the drywall mud dunking and doesn’t seem to have any problem with it. Festool does indicate that this behavior is not recommended and could potentially void one’s warranty, but it is reassuring to know that a drill that is left out in the rain or has accumulated a lifetime of sawdust in its vents can still function. Learn more about the NEW Festool CXS! 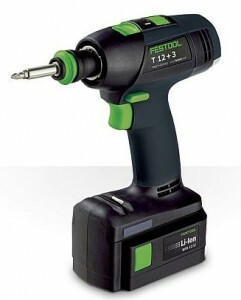 Check out the Festool drills and drilling accessories we offer. Take a look at our entire selection of Festools.